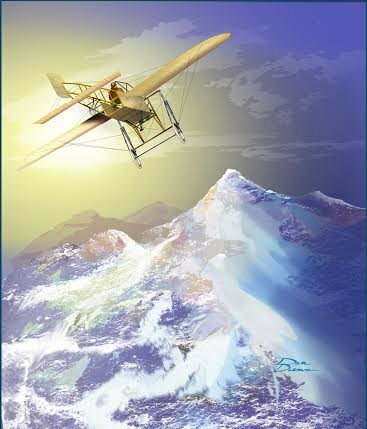 Jorge Chávez entered a competition sponsor by the Aero Club of Italy with a prize of $20,000 for the first air crossing of the Alps. After several delays due to bad weather, he took off from Ried-Brig, Switzerland on September 23, 1910, and made his way through the Simplon Pass. Before takeoff he told his friends "Whatever happens, I shall be found on the other side of the Alps".Fifty-one minutes later he arrived at his destination, the city of Domodossola, Italy, on his approach to landing. Just 30 ft of the ground the wings of plane buckled and fail to the ground. It is believed that his airplane had been inadequately repaired from previous damage, and further weakened by the heavy turbulent winds of the mountains. Critically injured but conscious, Chávez in severe pain spoke his last words to his friend and fellow aviator Juan Bielovucic… "Higher Always Higher."